Capping is often referred to as air entrapment. Upper punch is generally designed slightly smaller than lower punch in order to push away the air between tablet press punches. If the air not be eliminated, air entrapment will plump up on the surface of pills. The quality of material is also a fundamental factor. Dry and fine powder could not drive away the air. Chipping also means broken pills that may be caused by many factors. The most directly and possible reason is its very nature feature of fragility, which makes it very sensitive to compression pressure. 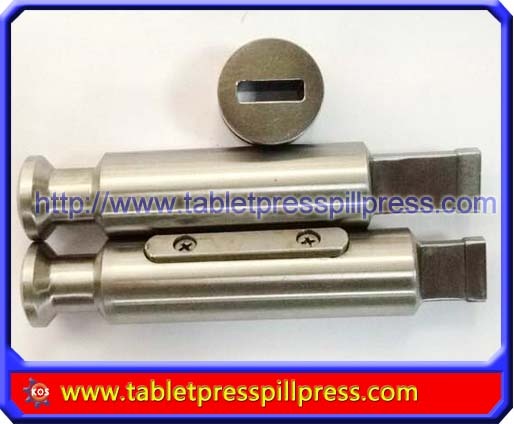 Lamination occurs when the tablet splits apart anywhere except at the upper cap. It may be caused by over pressure and fine&light granules. The effective method is to reduce thickness of tablet or to increase dwell time. Dwell time could be increased by adding pre-compression power or slowing the machine operating speed. Picking and sticking occurs when granules stick to the punch faces during compression. Sometimes the punch face design and debossing can be modified to eliminate the problem. Other times granules are not dried properly. They become case hardened during the drying process, which means that the granules are wet inside. Subtle techniques and careful craft are required to improve such situation.